Janice didn't know where to start after ending a twelve-year abusive relationship, the death of a friend and struggling to stay sober left her in a deep depression. Janice left the waiting area of the Henderson County Safelight Family Justice Center three separate times in the years prior before admitting, "I need to do this for me." She had finally reached the point where she was ready to participate in Safelight services. 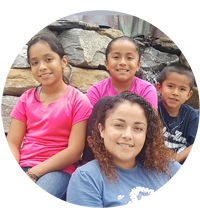 Janice entered the Safelight shelter in February, 2015 with her three school-aged children. Even though she had been sober four months, she began her time at the shelter feeling like she was in a deep hole. Large debts loomed and she had no job, car or license and was on probation. She and the children needed counseling and guidance to begin to build a new safe and self-sufficient life. Janice began work as a Dandelion Eatery intern two months later and though it was difficult, she was never a quitter. She knew if she stuck to it long enough, things would turn out okay. On days when it seemed particularly rough, Janice knew that everyone at Safelight always had her back. When an opportunity to cook in the café presented itself, Janice accepted the challenge and is now a chef and intern trainer. She loves to inspire others and to watch interns blossom. "That part of my job is beyond fulfilling," she says. Counseling and appointments with her caseworker gave Janice the opportunity to set and achieve goals. "Even when I didn't believe in myself they always believed in me," Janice said. Today, Janice is over a year sober, off probation, living in transitional housing, has paid off all of her fines, has her license and owns a car. With help from the counseling provided for her children, Janice's family has flourished as well. Janice is thankful for all she has learned and achieved through this journey and is eager to help others in similar situations.